This will be my last post for our recent Italy holiday – we managed to fit in so much! I think the fact my son wasn’t with me combined with us having a hire care meant that we could just get on with it as and when we wanted. Not that I don’t enjoy holidays with my son, they’re the best! But when it’s adults only, you just move that bit faster. Villa life = an easy life! That’s for sure. Waking early from another peaceful nights sleep we got ready for the journey over to the famous Cinque Terre. We’d decided to drive as far as we could dropping off the car at La Spezia and hopping on the train over to the first village, Riomaggiore. Cinque Terre is amongst one of the most popular destinations travellers consider when planning a trip to Italy. And for good reason — the region is stunning. If you’re not familiar then let me explain. There are five ingeniously constructed pastel-hued fishing villages set along some of the most photogenic coastal scenery I’ve ever seen. A UNESCO World Heritage site since 1997, Cinque Terre isn’t the undiscovered Eden it once was but, honestly, who cares? There is absolutely no reason to skip something beautiful just because others also recognise the beauty and want to visit, too. The five villages are made for walking — be prepared! We managed two in one day. If you’re the adventurous type then you could turn it into a hiking holiday, or a few days would be perfect for hopping on the boat or train between each village which is actually very simple. Thankfully cars were banned over a decade ago. Cinque Terre is unapologetically spectacular. Colourful houses drip from cliffs and hang over the sea. Sunlight sparkles in the turquoise waters and across the gentle curve of sandy white beaches with inlets for sunbathing and for docking small boats that bob along the harbour. Even in October people were swimming and diving from the rocks. Riomaggiore, the second smallest and most southern of the five villages, has one main street, a harbour, a rocky beach, a castle, a church, and dozens restaurants and drinking spots. Fisherman gather at the foot of the cliffs and locals go along doing their thing. My first impression of Riomaggiore is how well preserved it is. It has a way of transporting you to back to a simpler time… a time with no Starbucks signs and no other eyesores of modern day life. We climbed up one side, then back down. We stopped for coffee and a breather where all you can hear is the sound of the waves crashing below. Having climbed some more we eventually gave in and stopped for gelato. Not sure if it was the heat or just the fact that I was so in love with my surroundings, but it was the best gelato of my life. I had three BIG scoops and devoured it all. We then made our way back to train station and ventured north to the postcard perfect second village, Manarola. 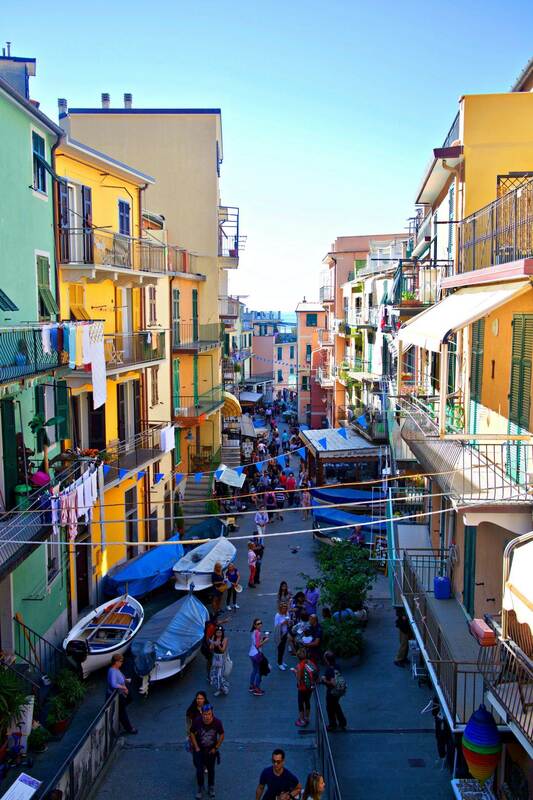 Similar to Riomaggiore, but with a more grown-up, kind of chilled vibe. It’s also a one-street village, with a small harbour where you can swim or take off your shoes and have a paddle. It has an incredible spot where the most famous Cinque Terre photos are taken from. But, as predicted, the best views are from the top! In fact, if you ask me, each person reading this should do their stomachs a favour and put Italy on their bucket list. The country is made for foodies, not just ice-cream fans! Meals are filled with fresh home-made pastas, just-out-of-the-oven focaccia, sauces burst with flavours, there’s desserts you can only dream about and wines made from the countryside not far from where you actually sit. All of this food talk reminds me I have one more thing to show you. Let me introduce you to Nessun Dorma (translates as: “may no one sleep,”) which is built into the cliff-side where most of the produce is grown on site. Sofas, lounge chairs and tables overlook the rocky harbour with the shimmering azure water below. You can’t book, they only take cash and everyone lines up along the cliff-side where you have a little time to get a little snap-happy. Queuing is quick though, don’t worry. I spotted someone with the same camera as me so cheekily asked if he’d mind taking a cheesy family photo of us. He kindly obliged. It’s a keeper. Aperol or Limoncino spritz’ are highly encouraged. They don’t offer pasta or pizza, but they do serve the most mouth-watering Italian bruschetta, meat, seafood and cheese platters, and healthy salads if that’s your thing. What a magical place! If you do decide to take a trip to Italy or anywhere else for that matter, please do check out Clickstay. I currently have a discount code for all my friends and readers. Enter HelloCuppies at the checkout. You won’t regret it. With reasonably priced villas and apartments all around the world there’s an option for all. Wow. I scrolled through your pics, made me dream of summer and going back to Italy once day. Thank you for sharing. Ok so Italy was on my list of countries to visit before reading this but now it’s jumped straight to the top! It looks and sounds amazing! I just love those colourful buildings, and the gelato! Heaven. Cinque Terre has been on my bucket list FOREVER! Not only is the location stunning, but the colours of the buildings and the vibrance of the city are so enchanting. I can’t wait to go! I can’t wait to visit Cinque Tierre! Your pictures are absolutely beautiful, and it sounds like you’ve had an incredible trip! WOW! Italy is on the top of my list, always has been! Not just because it looks amazingly beautiful but also….Italian gelato!!! I so need to get a trip booked!! Oh what a beautiful place! I love the colourful buildings. Have only been to Venice in Italy, but would love to explore more areas like this within the country! Wow I visited Cinque Terre three years ago and I still in love of that place, I manage to do the route by train and see three of the towns. Manarola was my favourite, views were amazing. I’m loving all your Italy posts. I adore Italy – we took the children to Rome for the first time earlier this year and it was honestly the best holiday! We are hoping to explore more of Italy next year. Cinque Terre looks stunning. I agree on the food in Italy being amazing! The gelato is out of this world! This place looks so gorgeous! I love the colourful buildings. Definitely going to visit here one day!